3.5 stars: Packed with fascinating details, grim facts, and people dedicated to helping others. 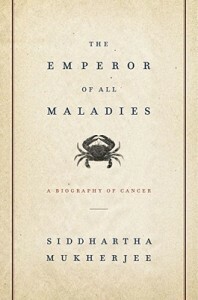 Mukherjee was an oncology resident as he was writing this book, which in itself amazes me. How in the world did he find the time? It goes into depth on many aspects of cancer, including historical references to it, and the many people involved in reaching our current understanding of it. The 1960's War on Cancer gets several chapters--along with the aftermath of that big push. The more hopeful news is that new drugs and new developments continue to be made--and made available--to the public relatively frequently these days. The not so great news is that even with all the progress that has happened, for many types of cancer, time left is still measured in weeks or months, not years. I thought it was very interesting that with some forms of cancer, being in remission at 5 years out is considered essentially a cure. As a reading experience, it was dense and long. I had to read a few chapters, then put it down and come back to it in a few days. Great bedtime reading--though! Interesting enough that I wanted to keep reading it, but not so thrilling that it ever kept me up past my bedtime! It was just about perfect in that regard. I knew I could read it until my eyes started closing on their own, at which time it was time to be done. If you've got the time and the inclination, this is a good one! I really feel like I learned a lot. I'm definitely interested in this one, but I think I'll have to be in the right mood for it. Yes. It's not a light read by any means.